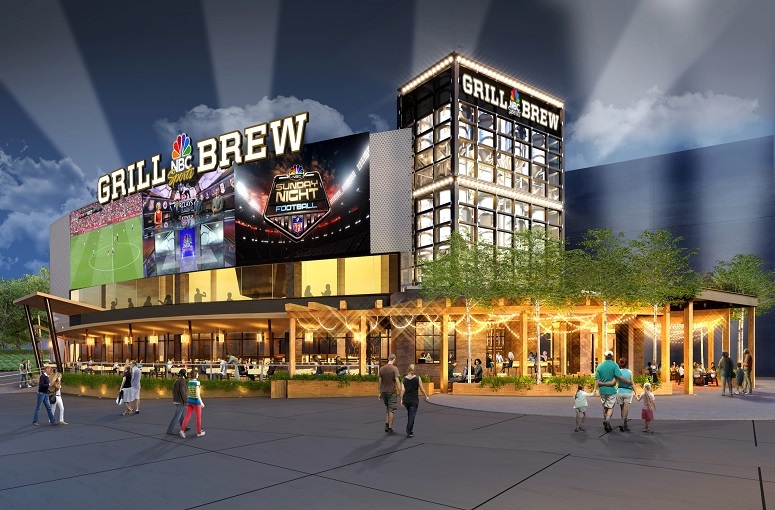 The world’s first-ever NBC Sports Grill & Brew is coming to Universal CityWalk – bringing an entirely new level of sports-dining experience. Opening this fall, the all-new restaurant is designed to reflect the excellence and excitement of NBC Sports’ award-winning coverage. The restaurant will combine a sophisticated and stylish setting with wall-to-wall sports coverage, a specially created menu that includes all your favorites and more – and an amazing beer selection. NBC Sports Grill & Brew continues the epic growth at Universal CityWalk. The entertainment complex recently underwent a historic expansion that included the opening of eight new venues in just one year. The two-tiered, 30-acre complex features a collection of themed restaurants, shops and nightclubs, including The Cowfish, VIVO Italian Kitchen, Emeril’s Restaurant Orlando, Jimmy Buffett’s Margaritaville, Antojitos Authentic Mexican Food, and Rising Star. NBC Sports Grill & Brew will be located right before the entrance of Universal Studios Florida, next to Element. For more information about Universal CityWalk, visit: https://www.universalorlando.com. RENDERING: ©2015 Universal Orlando Resort. All Rights Reserved. Agreed. This really needs to be completed before the start of NBC's Sunday Night Football.